Due to some additional changes to the overall outline and long term plans of the comic’s story, I’ve decided it is in the best interests of the narrative to make some changes to the strip’s overall premise. I’ll have to retroactively re-draw all the past strips to make this happen, but I think in the end the effort will be worth it as we grow to love this story of an orphaned human living amidst a world of amphibious humanoids. -EDIT- I apologize to everyone who tried to check in at the usual time and got a “Bandwidth Exceeded” downtime message. That was not part of my little joke, I just forgot to pay attention to site traffic. Fixed now! Naw, the bandwidth message was me not paying attention to site traffic. Alternate demention? I am going to have to save that one it is brilliant. yes, and alternate demention. Just mentioning the demention causes it to grow more powerful. Then as soon as you turn to the next page and forget it, it becomes weaker. That is the power of the demention. April 1st is the one day a year I avoid the internet, for all the smart reasons… I’ve been had, regardless. It raises a couple questions for me: Does this race gain markings as they grow? I’m guessing it’s part of puberty/adulthood, unless it’s, say, cultural-based tattoos. (also curious, could skin built to be amphibious hold ink the way human/mammal skin does? I couldn’t find much on it, though admittedly it is an odd query.) Also, they seem to have racial analogues but they seem inconsistant… I don’t know if it’s just personal differences or if they have a wider range of skin colors/markings, but it’s an interesting exploration into the races, canon or no. Awesome! Markings are always cool. :3 anyways great joke comic! I knew it had to be the gills yesterday. But knowing the anatomy your probably going to do the privacy screen again. Although you could do a swimsuit since you know Todd has to be interested how it works too. That strip was awesome and disturbing at the same time. Ohhhh jeez. I forgot about April Fool’s completely and thought this was some kind of imagination sequence, Selkie pretending SHE was the normal one. Not going to lie, this page is kind of sad in that context. xP Ya got me, Dave. Was the bandwith exceeded thing an Aprils fool too? Wait, all the amphibious humanoids are speaking normally, rather than having Selki’s “-s” issue. Does that mean that she has a speech impediment? I had assumed that her speech pattern was characteristic of her species. Without getting into too much detail, the lack of over-pluralizing is intentional. Heh, good. I wasn’t the only one then wondering what happened. Loved the prank though! Well, Dave, first off, I was gonna advert on Selkie for today but your bandwidth was exceeded. I was gonna email you and found I couldn’t find the addie anywhere! LOL Was gonna congratulate you 🙂 So you moderate your own bandwidth? As for the strip and April Fool’s Day, well, I figured it was just like Coming Up Violet and it was another reality. What a surprise:) Either way! I don’t moderate my own bandwidth per se, but my host provides optional bandwidth-cap add-ons which can be upgraded/downgraded as needed. I seriously thought you were gonna change!! It would have been cool if you had. But I’m glad you didn’t, the comic’s great the way it is. 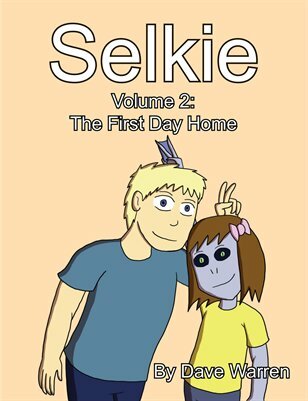 Selkie’s self-image, as someone living in a population of very different beings, is going to be tricky. She can “pass” as human in a lot of ways, but the differences (mostly physical, from what’s been shown so far) are all the more striking by contrast. As her new parent, Todd is of course keenly interested in her “special needs”. It’s great to see the full implications slowly sinking into him. From what I’ve seen in real life, no one is “ready” for being a parent ahead of time. You should’ve seen my original plot outlines. I originally planned for Todd to find out all the physiological differences (gills, etc) the same way he found out the carnivorism; on the fly. I think that schtick would’ve gotten a bit redundant after a while, though. Ok this is awesome, and i just have to say i love the fish version of todd, also i noticed that all the adults have shoes on, does that mean in this universe they have successfully developed mass produced comfortable fin shaped shoes? Yep! Which means that in this alternate universe, Sophie’s feet are too small. I’m glad you aren’t changing the comic though. I’d miss the old Selkie and Todd. Oh what a great joke! But at the same time, it’s rather intriguing idea, no? And poor Selkie with her gills. I inhaled a piece of hotdog once into my nasal passage by swallowing wrong, and it hurt like fire! True story, i was chewing, and alluva sudden I was choking and gasping. hotdog+nose=pain! I can laugh about it now though. but gills? Owie. I didn’t think of an April Fools joke (It’s still March here), I though it was a parallel story of a human swapped at birth with Selkie. And that going forward the story was going to swap back and forth. Shows how well I pay attention … I was on the third panel of the “April Fool’s” comic before I realized it was Sophie, not Selkie … Back in the “real world”, it does seem that Grandma is having some trouble accepting that Selkie is different. I hope this won’t continue to be a problem. And now that I mention going back and finding that page, it makes me think … you’re beginning to get enough material that you’ll need to be thinking “archive” pretty soon I think. Man, I am having a heck of a time putting thoughts together tonight. You mean like an organized, sorted archive? Probably a good idea! And as for the gills, they are located on the sides of the torso. She’s pointing to her sternum. 2 comics in one day. Yay! Gah… you got me. It took me a moment to recognize the differences in skin. I’d seen little banners around for a bit and then finally last Monday (the 21st) I was linked to a comic that had another of your banners, but of the 125X125 gif variety. With a little more glimpse into just what your story was about… into the abyss I was drawn. I went through your archive, but was both a little too tired and a little too busy to read through your anatomy sketch. On the following Wednesday I gave it a look through and whilst on the bus did the next slew of questions come to be. Next question: regarding her species reproductive cycle… you wrote about that the species typically gives single birth; does this mean that her species has pregnancies of only one child (my assumption), or that they can only ever get pregnant once (a possibility for sure)? And regarding the flush with fresh water (which incidentally you have brought up in this update); I had assumed at first that her species was a marine dwelling race, however seeing the flush with fresh water as opposed to saline (which even humans use for most every flushing purpose) leads me to think that she’s from a race of fresh water dwellers; perhaps from the swamps of myth? So, the question here (if you may answer it) is; Where does her race typically live? I knew the animated gif advert was a good idea. XD Glad it snagged you! 1. Selkie’s “food allergies” are (as you suggested) better phrased as “intolerances”. I feel “allergy” is a more common word for the characters to use, though. And really, “sensitivity” and “intolerance”, in regards to Selkie, are actually just euphemisms for the fact that she is carnivorous, and biologically incapable of digesting plant matter. She can eat meat from animals that consume plants, just not plant-based foods themselves. Digestion is easier, though, for items that have been processed or broken down, such as sauces and some seasonings, especially if they are taken WITH meats or cheeses. Which means, for example, Selkie could eat teriyaki beef jerky safely. Any plant matter involved is so broken down that it just slips on through the digestive tract unnoticed. 2. Reproduction is comparable to humans in that they generally give birth to one child at a time. Twins are still possible, but the mortality rate of the twin babies is higher compared to humans. They can (and do) have more than one child over the course of their lives. Coming back to this page after more recent revelations, and seeing the skin colors and marking patterns on this page… touche, the level of pre-planning is becoming clearer and clearer every time I do an archive trawl. Hats off to you, good sir (or madam or otherwise, I guess I never checked). I can’t wait to see what this and future works of yours have in store. So, I tried checking the real version of this strip, and I’m getting a page not found error. Is there something wrong with the link? I moved the site to a new host recently, some things keep turning up as lost in the shuffle. I’ll try to get it re-added, thanks for letting me know.